More than ever, we need to look after each other, one another, and to take care of ourselves. How can this spirit of care constitute a productive way of working together institutionally, organisationally, curatorially? During the Fall of 2018, PUBLICS will begin to give over its program to the work of others, and to those institutions who are in need of space to practice and to support the realisation of their projects publically. PUBLICS will become the host to other peoples, other bodies and their ideas, and be taken over and on many levels we will be preoccupied by them. PUBLICS will take care of its para-sites; its para-institutions; its para-guests. Its space will become the workspace of other curatorial initiatives. ‘Parahosting’ is a program of residencies, performances, talks, events, and productions, where PUBLICS will look after other projects, organisations and collectives; opening its doors for free and sharing its resources, its space and offering its full capacities for other’ activities. ‘Parahosting’ is an essential means of working together without boundaries, with the parabeing conceived of as operating away from, alongside or supplementary to, and we wish to propose ‘parahosting’ as a progressive terrain for organisational praxis that both operates within the curatorial paradigm and retains a destabilizing relationship to it via (para-) texts, sites, works and institutes. To arrive at a para concept – an understanding of something ‘other than’, ‘beside’, ‘outside’, or ‘auxiliary’, operating at a distance from the main act – is a means of re-establishing the binary between primary and secondary curatorial labor. In this sense, ‘parahosting’ is a useful term to describe transitional temporal processes of engagement with people taking precedence over exhibitions or productions as the primary end product. In the face of such a reductive scenario, ‘Parahosting’ proposes an evolving field of operations that persists in resisting the established order of things as part of the destabilizing curatorial constellation. WASTED (Roy Boswell, Laura Jantunen, Sonya Lindfors, Pauliina Sjöberg, Kristian Palmu & Anni Puolakka) was a durational collective performance taking labour as its framework; as idea; as practice and as a focus. 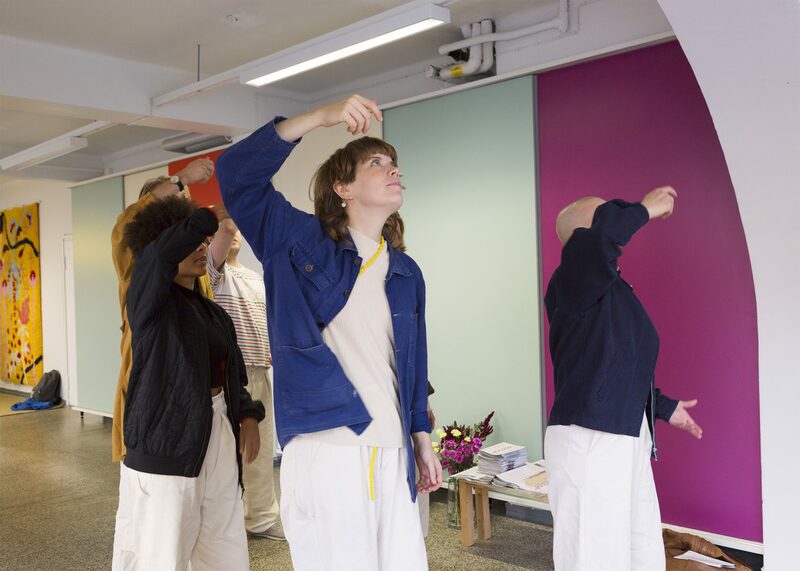 In September WASTED took up residence at PUBLICS space for four weeks in Vallila where the collective worked closely together to script, develop and prepare a newly made work about work. At the end of their time at PUBLICS the collective realized a participatory performance involving different level of engagements for the audience. The 17th edition of ANTI – Contemporary Art Festival will take place in September 2018. Artists from around the world will present projects engaged with ideas of play, playfulness, games and gaming. Held annually in Kuopio, projects inhabit the spaces of public life and directly engage communities and audiences. In 2018 the shortlisted artists for ANTI Live Art Prize are All The Queens Men, Nic Green, Jeanne van Heeswijk and Sonya Lindfors. Frontiers in Retreat project (2013–2018), co­-ordinated by HIAP, has acted as a base for multidisciplinary forms of thought, research, and production, in which artists, researchers, and specialists from various fields track the elements of a ‘post­fossil’ paradigm to come, after the current, oil­-based society. The Midden – Critical Dictionary of Ecology draws on the project and explores the roles of art, fiction and philosophy in relation to the future. In includes texts by Jussi Parikka, Emmi Itäranta, Antti Salminen, Taru Elfving, Jenni Nurmenniemi and Tracey Warr. Prison Outside #2 is a cross-disciplinary discussion on artistic projects in and around prison. It takes place on November 21st–23rd in Helsinki and will present speakers from Finland, Russia, Ireland, USA, Canada and Belgium. The program includes presentations, round table discussions, film screenings, and workshops. Free Translation, an exhibition of artistic and literary works on imprisonment will be launched during the conference. The project looks artistic practices in prison, and their effect on rehabilitation, understanding the histories of incarceration, and encouraging communication between people of different walks of life. Organized in 2018 for its second outing, Bookies is a independent art book fair as well as a series of discursive events dedicated to publishing as forms of artistic practice. It consists of a two-day seminar of talks and presentations, a book fair and an exhibition. Aimed at artists, students and curators operating at the intersection of art and publishing, Bookies will map out current shifts in an ever expanding field for artist’s publishing. At PUBLICS, Bookies will bring visiting artists, innovative publishers, editors and distributors together to present a diverse cross-section of their publications available for browsing, research and purchase during the fair.